Belted Galloways are a heritage breed of cattle and date back to the early 1800's. 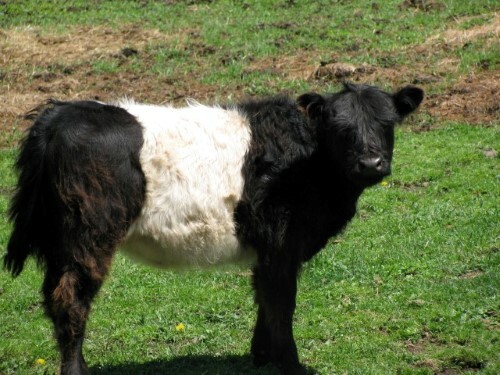 The exact origin of the white belt across their belly is unknown, but it is thought to have come from cross breeding with Dutch Belted cattle. Belted Galloways are raised for their high quality beef that typically has a marbled appearance. This means that it contains various amounts of intramuscular fat within the lean meat. Marbling is achieved by selective breeding and is also influenced by feed. They are known for grazing land that has coarse grasses that other breeds will not eat and are able to produce high-quality beef on an all grass diet, making them very adaptable to even the poorest pasture regions. You will find that Galloways are raised in areas similar to their native Scotland climates like Pacific coastal areas. Galloways are naturally polled /do not have horns. They have quiet temperaments, but the females are still protective of their calves and will protect them against any threats. There were formerly on the Conservancy “watch list” but are now categorized as a “recovering breed”.Nearly 19,000 registered Belted Galloways were in the United States in 2015.